During the late 19th century, Italy was a unified country but in disarray. A north-south divide existed with northern Italians contemptuous of the backwards south. The south was resentful and paranoid about prospects of exploitation from the north. By the end of the century, millions of Italians were leaving their homes for America, some for political reasons but most for economic opportunities. Southern Italians were barely surviving in the hardscrabble agrarian economy. They were trapped in a feudal land system with no hope of progress as absentee northern landlords drained their earnings. In the late 1880s this misery was compounded by plagues of malaria, phylloxera (plant lice, earthquakes, and volcanic eruptions). Added to that were negative effects of the Italian Revolution. In attempting to unify Italy, one of the first acts of the new Italian government was to eliminate the Roman Catholic Church from the new nation’s education system. For the North where a public school system already existed there wasn’t much of a problem; in the South there was no educational system except for the Church. Like most working people of the time, parents believed a craft was far more important than general literacy. If children were to be lettered they would have to enter religious life or in the secular world go far away and at a great expense. This created large numbers of Southern Italian youth born in the 1880s that were raised “percho analfabeti” – without letters – but skilled in crafts and trades that allowed them to survive. Not only was the south separated from the rest of Italy by politics and economics, but the combination of its dialects, geography, and history made it a world apart. To this day, while still rooted in tradition, it is wilder and more backward than Northern Italy. Known as “Mezzogiorno” (midday) by Italians, the area is marked by lonely villages and empty untrammeled landscapes. Clichéd images in rural areas still prevail with shepherds driving herds of sheep across stony hills, black-clad peasant women, washing hung across streets, and classic passions of food, family, love, and religion. Poverty, crime, and other social ills are amplified here along with Old World ideals of honor and hospitality. These images and ideals were strong influences on the inhabitants who would pass them along to their families. Geography molded the character of the region by placing it far from markets and unable to support industrialization or large scale agriculture. Climatically, during the summer months, it bakes under an almost African sun impeding agricultural development and in areas away from the coast the winter is bitter and cold. The poor soils are unsupportive of agricultural development and the mountains are devoid of raw materials. Historically, the region was conquered by Phoenicians, Carthaginians, Greeks, Romans, Arabs, Normans, Swabians, Angevins, and Bourbons, all providing influences to the area. For centuries it remained in a feudal system and finally in the hands of Spanish rule, a stagnation settled in that continues to this day. This system of land ownership known as “latifondi,” where large estates employed landless laborers was exacerbated in the 1860s by confiscation of church lands during Italian unification. During the next 20 years conditions for peasants declined further as more land went to private owners who deforested it, increasing the spread of malaria and landslides. In the 1880s Europe suffered an agrarian crisis which brought ruin to many of the Southern Italian landowners and also diminished the economic situation of the peasants. In this era fewer than half the children lived past the age of 15! The region known as Basilicata does not match the images most people have of Italy. Small and mostly mountainous, the region is situated at the “instep of the boot” in Southern Italy. It has large tracts of barren and eroded wasteland resulting from systematic deforestations over the centuries. The enormous emigration of the past has left it under populated. The economy is mostly based on subsistence agriculture with the eastern and central areas almost desert-like. Industrial development is low, but there are some flourishing craft sectors, such as ceramics, woodwork and textiles. Tourism is mostly along the Tyrrhenian coast. Archeological findings show areas around the region’s rivers were inhabited since Paleolithic times. In the 13th century BC the Lyki, (probably the origin of the name Lucani, which is another name for the people of the area) came from the Danube area of northern Europe settling the region. In the following century they were enriched culturally by the Greeks, who colonized the area. 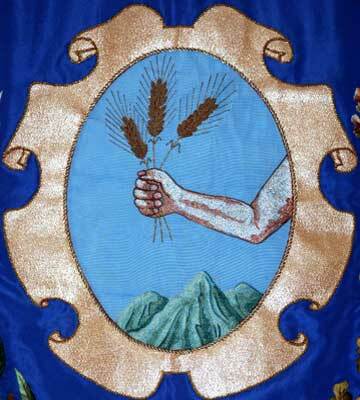 The Lucani established a strong military state and fought against the inhabitants of Apulia for centuries. After being allied to the Romans, they sided with Hannibal in the Punic wars. Under the Roman Empire the region was called Bruttium. In the Napoleonic era it was under the control of Naples which was allied with the French. After 1815 it was part of the Kingdom of Two Sicilies which was under Bourbon control. Between 1932 and 1945 the region was renamed Lucania, and finally became "Basilicata" under the Republic. Today Basilicata is divided into two Provinces: Matera and Potenza. Potenza serves as the administrative center for the region and is the major town associated with it. The Italian province of Matera has in it the “comune” of Craco, the hometown of over 1,500 families who left there between 1892 and 1922 for opportunities in North America. Around 540AD the area was called “Montedoro” and inhabited by Greek monks who moved inland from the coastal town of Metaponto to escape the unhealthy conditions along the marshy coast and the constant threat from seafaring raiders. However, tombs have been found in the area dating from the 8th century BC, suggesting the original settlement may date back to then. The town’s name can be dated to 1060 when the land was the possession of Archbishop Arnaldo, Bishop of Tricarico, who called the area “GRACHIUM” which means “from the little plowed field.” This long association of the Church with the town had a great influence on the inhabitants. The inhabitants of the town went from 450 (1277), to 655 (1477), and 1,718 (1532) until reaching 2,590 in 1561; and averaged 1,500 in succeeding centuries. During 1656 a plague struck with hundreds dying and reducing the number of families in the town. With the unification of Italy there was a growth of “brigands” in the area who plagued the town until the mid-1860s. With the end of the civil strife the greatest difficulty the town faced became environmental and geological. During the mid-twentieth century, recurring earthquakes began to take a toll on the viability of the town. Between 1959 and 1972, portions of the village were severely damaged and rendered uninhabitable by a series of frana, or landslides. 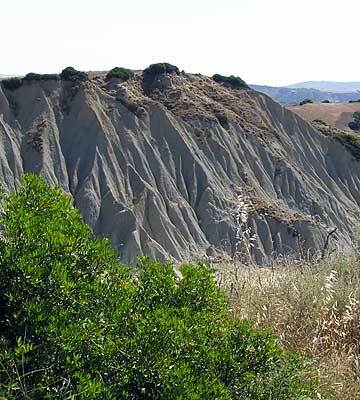 The geological threat to the town was known to scientists since 1910, due to Craco’s location on a hill of Pliocene sands overhanging the clays, with ravines causing progressive incisions. Now, Craco is uninhabited. 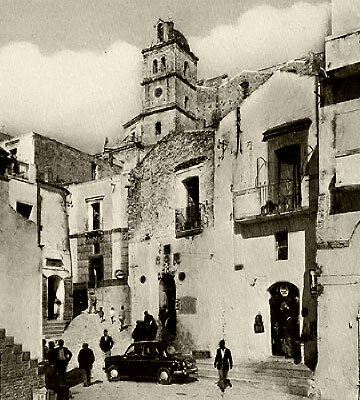 In 1963, the 1,800 inhabitants were transferred to a valley in a locality called Craco Peschiera. That population is now down to under 800 inhabitants. The Piazza di Largo Vittorio Emanule II, circa 1962. 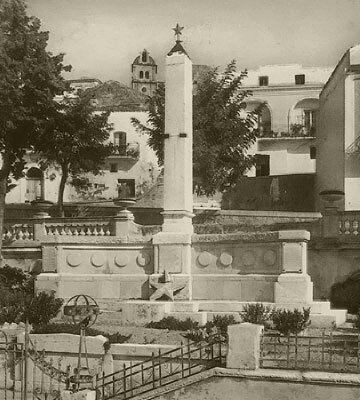 The War Memorial in Craco Vecchio, circa 1960. Churches are central to the town’s history with its founding stemming from monks. Noteworthy buildings include the church of the Observant Friars Minor dedicated to St. Peter, which dates back to 17th century and has now been partially restored and used as a conference center. The church of Santa Maria della Stella, a small chapel built on the hillside is part of an active association paying homage to the Virgin Mary. The site of the chapel is the location where the statue of the Virgin and Child was miraculously discovered in a body of water by a shepherd. The statue of the Virgin is still housed there, although the original infant was stolen and replaced. There is also a small new church in Sant’ Angelo, the only remaining section of the hilltop that is still inhabited, which houses the religious relics of the mummified body of St. Vincenzo - the martyred patron saint of the town. It is actively attended to with fresh flowers brought into the church daily. San Vincenzo was a soldier in the Legion of Thebes, the army of General Massimiliano in 286 CE who was martyred because he refused to renounce Christianity and worship the Emperor Marco Aurelio. His relic was brought to the town in 1769 and moved to the new little church after the old town collapsed. A story is told of another town, Pisticci, claiming the relic should be in their town and a group from there tried to take the relic. It became too heavy for them to carry very far and was abandoned on the road where the people of Craco found it and returned it to the town. 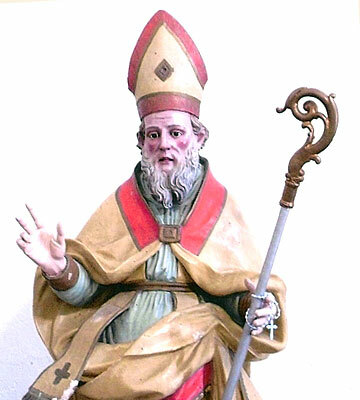 For more information about San Vincenzo, patron saint of Craco, click here. There is one other church in the old town town, Chiesa Madre (di San Nicola Vescovo - St. Nicholas Bishop). Its arched dome stands above the skyline just below the Tower and was the largest church in the village. With the collapse of the old town, the statuary and interior fixtures were moved to the new church building which is now at the center of the new town, Craco Peschiera. Although modern in appearance on the outside, the old statues inside from the original church provide a transition to visitors that give them the atmosphere of old Craco. The agricultural traditions of the town also continue with a local market held in Craco Peschiera each month. 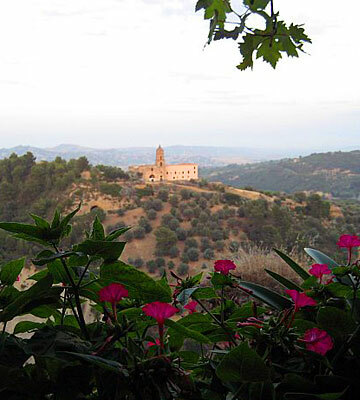 Today, the old village majestically rises with its Norman Tower visible in the surrounding valleys, retaining a special charm that attracts tourists as well as old inhabitants.